Although I had operated from this site in June 2015 for the VHF field day (and the 6m contacts counted towards the SOTA 6m/10m challenge) I was hoping to increase my “unique callsigns worked” count by operating from this site. It has a good lookout towards the Sydney area and on a clear day you could probably see the big smoke, if that makes any sense. The 10m antenna was lent to me by Andrew VK1AD, who had two similar versions. It is a half wave fed by a tapped quarter wave coaxial line, usually called a J pole. The tap point is at a position where a good match is found to 50 ohms, and the top end of the quarter wave is a reasonable match to the bottom end of the half wave. This arrangement works fine for low power. Matt VK1MA had been onsite during the morning and was just packing up when I arrived. We chatted about conditions and how the bands were working, then Matt headed off to his next summit which was Mt Gibraltar on the other side of Mittagong. So at about 2:30pm I started operating at the Katoomba lookout point on Mt Alexandra. With several 6m and 10m contacts made during the afternoon it was productive if a bit slow. One of my strategies for finding new contacts was to call on 52.525 FM which has some following in Sydney. I did make one contact that way, but probably did not have enough signal level for the average mobile in Sydney. Calls via the 6m repeater seeking simplex contacts got no replies. On the ssb end of the band, there were several responses to my CQ calls on 50.150 which is supposed to be the calling frequency within VK. I did call cq on 50.110 and got one reply, and we moved up the band a bit to leave the calling frequency clear. On 10m FM I did hear a Japanese station but my 10w was not making the grade back to him. 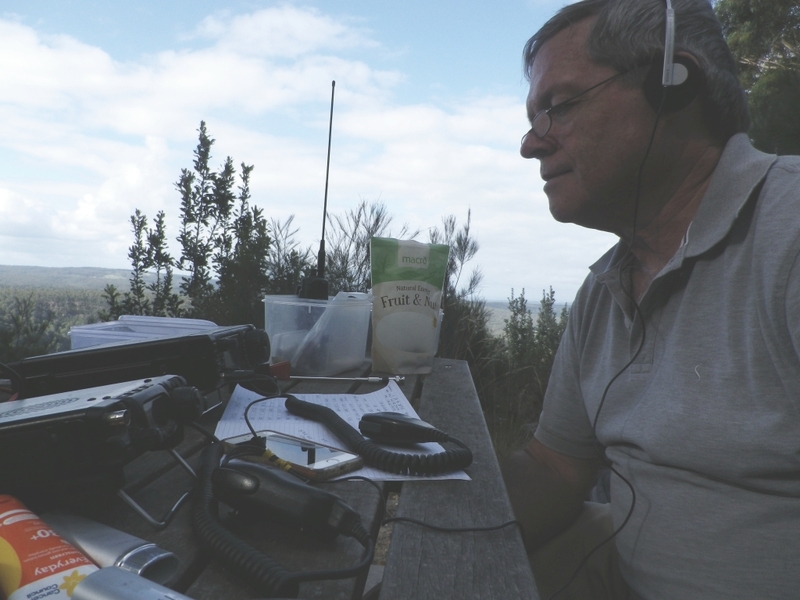 The most fruitful mode was ssb on 10m, where I did work several vk4s as well as some Sydney area stations. I had arranged with my wife to meet her in the car park at about 6pm. So at about 5:30 I started to roll up cables and put the gear into the backpack. Walking down a steep section of the track back to the car, I managed to put both feet onto slippery surfaces at the same time, resulting in a probably very funny sight, with me falling backwards onto my backpack, and in the process flinging my hands out and back, to “break my fall”. That was not a good move. It didn’t break my fall but came close to breaking a bone. My right wrist was in some pain and I sat on the ground for a minute or so before I could get up and resume walking. I had fractured the radius bone in my right arm, quite close to the wrist. 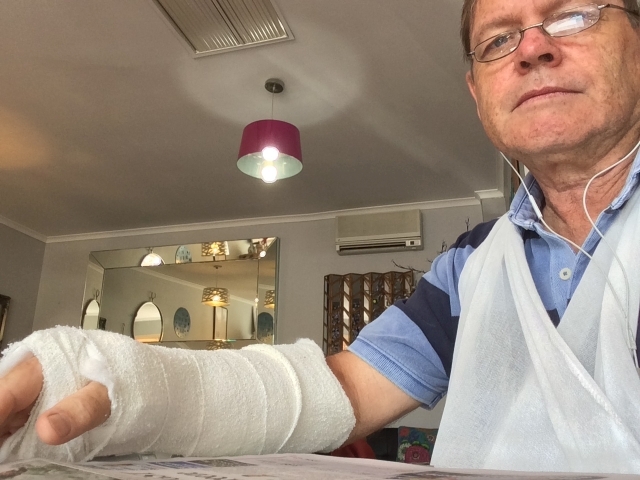 I ended up being treated by the emergency ward of the hospital the next day, then discharged with my arm in a cast and 6 weeks of relative inactivity ahead. I can only think about the many times I have been much further from my car or another driver, yet have climbed up and down rocky paths and gravel roads without any mishap. But any of those places could have produced a similar result. A sobering thought. So that ended my activations in the 6m/10m challenge a week earlier than I had expected. I am now temporarily writing (and sending morse) with my left hand. My handwriting is not pretty (and my morse is tentative and slow). I count myself lucky though – this could have been worse. But my wrist will mend and I will have the use of it again. Incidents like this make you appreciate having two arms and hands.